With a stay at Classic Hotel in Budapest (Ujbuda), you`ll be within a 15-minute drive of Gellert Thermal Baths and Swimming Pool and Szechenyi Chain Bridge. 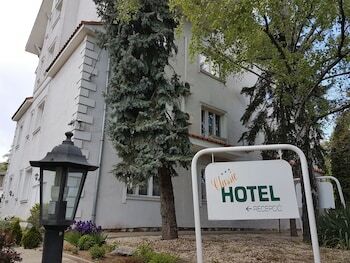 This hotel is 2.1 mi (3.4 km) from Danube River and 2.7 mi (4.4 km) from Buda Castle. Make yourself at home in one of the 34 guestrooms featuring minibars. Complimentary wireless Internet access keeps you connected, and cable programming is available for your entertainment. Private bathrooms with bathtubs or showers feature complimentary toiletries and hair dryers. Conveniences include safes, housekeeping is provided daily, and irons/ironing boards can be requested. Satisfy your appetite at the hotel`s coffee shop/café. Quench your thirst with your favorite drink at the bar/lounge. Buffet breakfasts are available daily from 7 AM to 10 AM for a fee.